Cherokee strictly follows a downtime-free policy. This also applies to the process of log rotation. No need to interrupt any active connections just to do this. This operation involves using cherokee-tweak and the remote administration handler. Logging is an operation performed on a per-virtual-server basis, so rotation must also be done this way. For simplicity’s sake we’ll make an example with just the default virtual server present, but the process is exactly the same for more. Independently of the number, just one rule is needed as entry point for the handler. Set Cherokee to backup mode, which will start logging to an internal buffer. Locally rotate the logs: this operation is not performed by the web server. Restore Cherokee to production mode, dumping the logs in the buffer to the new file and continuing with business as usual. You must be very careful when setting up cherokee-admin. Security should be of concern, since unauthorized access could in theory keep the server in backup mode until it runs out of auxiliary buffer space. First, the remote administration handler must be configured, so we will have to create a rule for that (Virtual Servers → default → Behavior → Rule Management → Add New). We will use a directory-type rule. 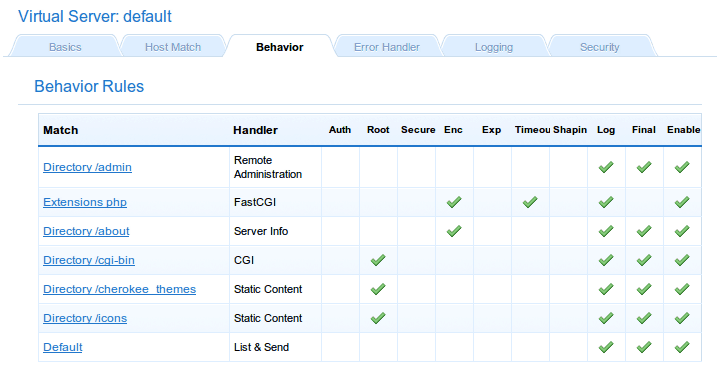 This handler will allow performing administration tasks, so public access is not an option. You can leave free access, but you should not. 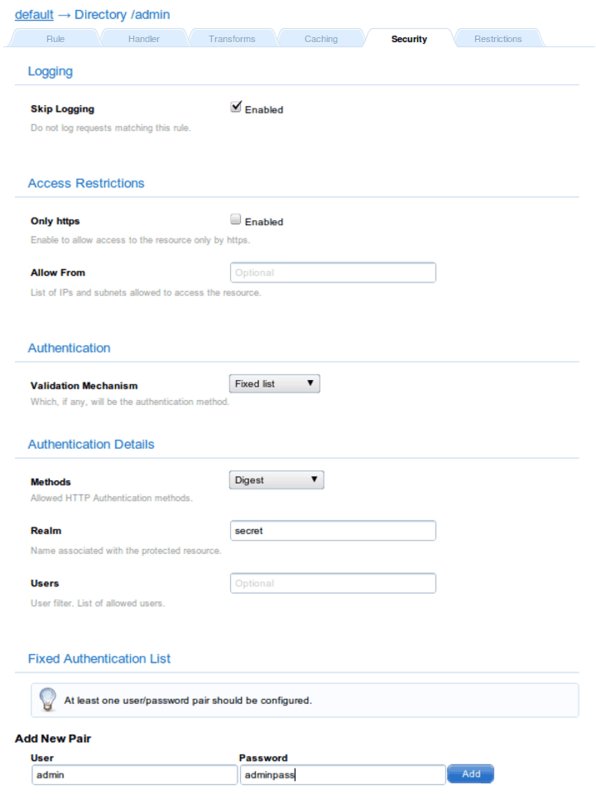 Don’t forget to fill in the Security tab of the rule to specify a validation method. Using Digest mechanism and restricting to only allow HTTPS connections is also strongly advised. In this example, we will use the simplest of all, the Fixed list validation mechanism and will define the user admin identified by the password adminpass. Of course you can use any other method available. Remember to save the changes through a graceful restart, since the main purpose of this recipe is not loosing any logging information and keeping the server online. To actually rotate the logs, you must use logrotate as command parameter. user and password, since the administration interface has restricted access. That should do it. cherokee-tweak is a powerful tool. Take a look at the parameters and you find out if it can solve some of your administration problems.